It has been a good weekend! It got off to possibly the greatest start ever – the alarm went off heinously early for a Saturday, due to our impending garage sale. I decided that Wes could bully me out of bed to get stuff ready; but to my delight he slipped out and put out all the signs, while I fell back into a deep coma. It got better. When I prised one eye open an hour later, hating the world, and wondering what good could possibly come of today, Wes appeared and said “How do you feel about an egg sandwich?”. “Ummm… pretty good” I replied, slightly confused. Whereupon he disappeared into our en suite bathroom and emerged with an egg biscuit the way I like (no bacon, no cheese) and said “I got coffee… decaf… poured 25% out, replaced with cold water and added milk from home”. I was speechless and very, very grateful. We then held our garage sale: it went well! OK, we didn’t quite make the dent in our credit card that we had hoped, but we did get to shift a lot of junk and more importantly: meet several of our neighbours, all of whom where extremely nice and welcoming. Saturday was meltingly hot, and being outside for that long took it out of us. The rest of the day was spent chilling, washing hair, and then having pizza for dinner while watching UFC (awesome, awesome fight between Silva and Franklin. You have to love Franklin, but Silva was indeed a tornedo. So impressive). Sunday was great too – on our way to church Wes was unwell, so we had to turn around. This lead to brief bout of me lying listless on the sofa bemoaning the wasted day, so Wes bargained some uninterrupted Diablo III later, in return for dispensing some immediate entertainment. 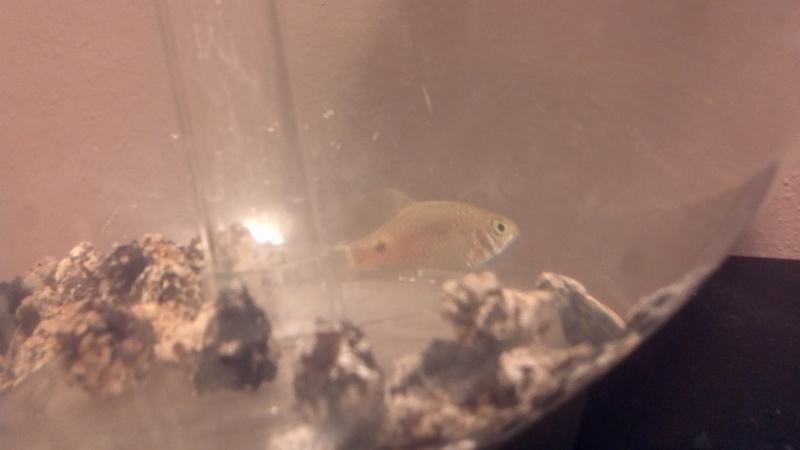 Thus, a few aquaria were visited and the lovely Anna bought for my study: she is a long rosy tailed-barb, and you can’t see it here, but she has very long, baby-pink tinged fins. Then, after Anna: more seeds (spot my new thing)! I have persuaded Wes not give me a ‘flower’ patch as well as a ‘vegetable’ patch. I am refusing to buy actual plants, and am still learning what works, which is part of the fun of gardening to me. I don’t necessarily want to read a book and follow instructions, I just want to try out different methods and learn from my mistakes. 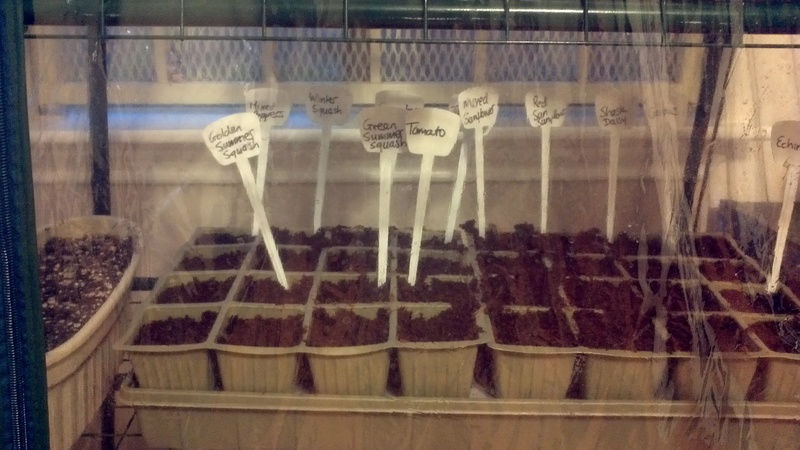 I have learned that seeds started in the greenhouse work well… transplanting them early does not. Making my own soil mix with Perlite for drainage works well… those pre-made deydrated soil pellets do not. Also, I now know to grow seeds in proper seeds starter pots, not fancy decorative ones, so they can get a root system around the inside of the pot, which should ease the transplant. I am currently experimenting with direct sowing, hardening my seedlings outside, and beans in water. 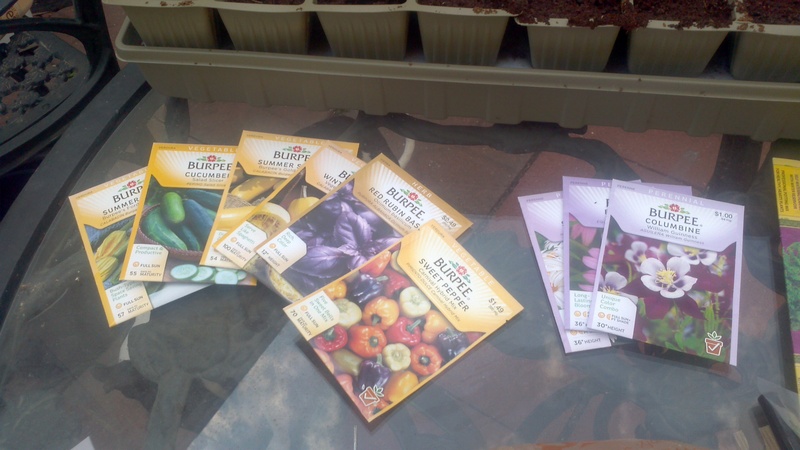 But, if all else fails, what I have learned has been enacted in my new seeds starter kit in the greenhouse. 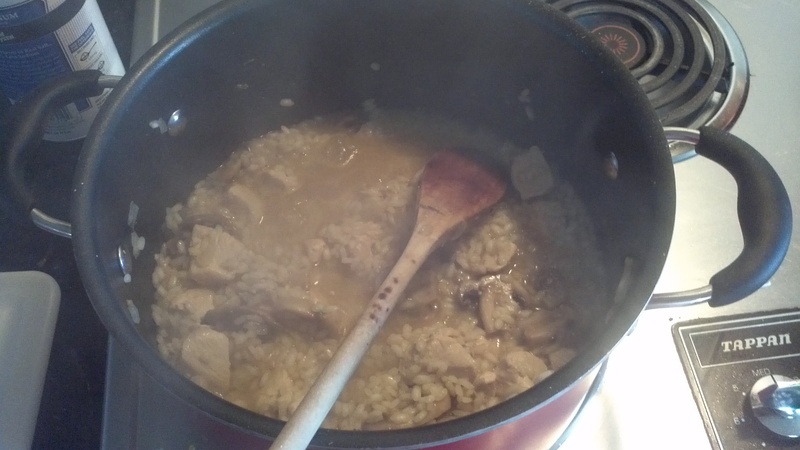 Risotto… so easy, so yummy. 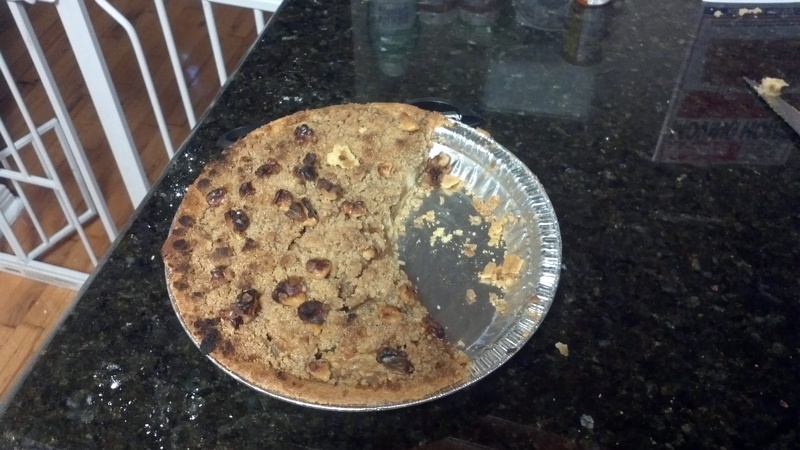 and apple streusal pie for dessert. Wes tapped out after the risotto, I ate nearly all of this! 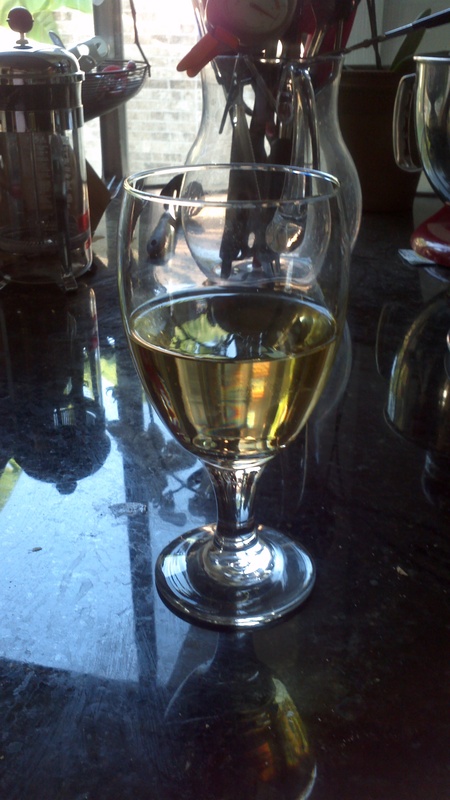 My first one in 3 weeks (I had a glass on our anniversary to recover from moving) and my last one until my birthday. I actually got quite tipsy. Now I am back on the Minute Maid light, fighting the urge to fall asleep at 9 pm, and looking forward to work tomorrow. Yes, actually looking forward. I was nervous before starting at UT, because I had no idea what it would be like being faculty. I had enjoyed some degree of independence both in the latter stages of my PhD, and throughout my postdoc. But regardless, during those times I was always someone else’s responsibility: someone else was in charge of keeping me busy and productive; providing me with data and guiding my ideas. In discussion with my postdoc mentor, I chose to transition to faculty without data, without papers, and without any grants (OK, the last one wasn’t actually my decision, but it is how it ended up). I chose to take a position (like many do) where I was employed to follow my own ideas, and not one (like many others do… and I was offered) to work on a given study / data-set. It suited me, but of course the chance of failure is higher than joining a group with the data ready to start to answer your ideas. I actually had no idea what my first few weeks would look like. Well, it has looked like hundreds of meetings. I do of course, have mentors. Both mentors have set up meetings with me, and expressed an interest in helping me if they can. In fact, one of my mentors met with me and offered me a choice: did I jump into his (huge) study, start running analysis for the group, find out what interested me, develop an idea for an ancillary study based on what I was doing, and then have a neat little package to offer to NIH in grant form with his (fairly powerful) seal of approval? Or, did I want to strike out and do my own thing? I’ll be honest, feeling very young, and very new, and quite overwhelmed in his office, the temptation to chose the former was strong. But I just said “I think I would really like to follow my heart and my ideas”. He was supportive! He wasn’t sure how he could help, but he would think about it, and took the time to talk me through some ideas. So – how has striking out looked? It has looked like: every day, emailing people and asking to come and hear about their work. Inviting people to hear about mine. Smiling a lot. Even walking up to everyone I see in the corridor, whether I know of them or not, and holding out my hand and saying “Hi, I am Lekki, I am new faculty in Epidemiology. I sit in the Genetics Center’ while grinning like a loon. It feels very like building a small business. Finding out about everyone’s studies and data, and what they have, and researching the heck out of it. Thinking up ideas for other people’s data that interest me, or I think could feed into my ‘end idea’. Also, looking for projects where I can ‘get my feet wet’ and work with people, keep some publications going, even as a minor author so that I can learn, learn, learn (these are sometimes the most fun!). Plan a lot about where I want to be in three years, and how I am going to get there. I am lucky: UT are great. A lot of people have gone out of their way to make introductions for me, or give me leads where I might be able to collect data. Some introductions I have made myself are panning out well, too. So, I am excited to get back, and keep pushing my work forward. I will let you know how it goes. -Said hello to everyone. Emailed people out of the blue. Just tried to get to know people. -Always been doing something constructive. I have no regrets, per se, about my postdoc, because I consider it very successful. But I do have things I have learned: and one thing is that in academia, there is never a need to be spinning your wheels (read: killing time on facebook or surfing the net). You can write review papers, you can write proposals for publicly available datasets, you can draft grants you’ll never send in (you’ll still get many of these benefits). -Had 3 specific aims, for the grant I would like to get on many years time, written out well. It has helped people see what I would like to do.